The Mets came back from the dead to have a legitimate chance to win on Friday night, but reliever A.J. Ramos’ inability to throw strikes ultimately led to them dropping an extra inning contest to the Brewers 4-3. Fresh off their ho-hum win Thursday in the series opener with Milwaukee, the Amazins’ felt good about their chances to take two straight with Noah Syndergaard on the bump. The big right hander did not have his dominant stuff early in this one, however, and it was clear from the outset this one was going to be a grind for New York. After an uneventful first inning and a half, Travis Shaw opened the scoring with a deep home run to put Milwaukee up 1-0 in the 2nd, a frame Syndergaard was fortunate to escape only one run to the bad, as the Brewers added two more hits before being retired. Amed Rosario swung the momentum back into the road dugout with a long homer to center to even the game in the top of the third, but that proved to be short lived. In the bottom of the third inning, Lorenzo Cain, Christian Yelich and Shaw all singled, with Cain and Yelich both stealing bases in the frame, and when the dust settled the Brewers had taken a 3-1 lead into the middle innings. Michael Conforto hooked a solo homer down the right field line to cut the Milwaukee lead in half in the fourth, but from that point on, the pitchers on both sides really took over. Syndergaard settled in as his outing moved along, as the only runner he allowed in his final three innings came courtesy of a Wilmer Flores error. The problem for the Mets though was that Brewers starter Junior Guerra was throwing just as well. 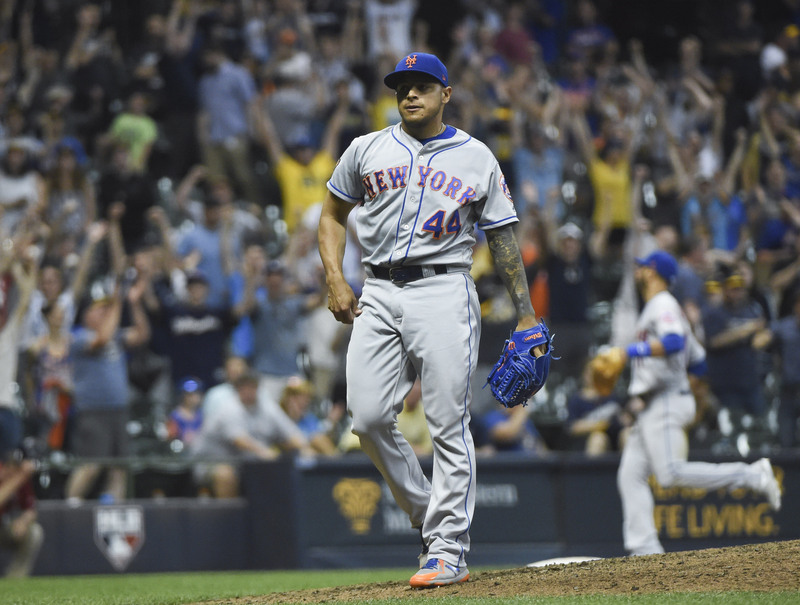 Both starters left after six, at which time both clubs summoned their primary bullpen weapons, Josh Hader and Seth Lugo respectively, and both turned in two hitless innings to carry the game into the ninth with Milwaukee clinging to the 3-2 lead. The Brewers handed the ball to closer Corey Knebel to attempt to finish the game, and after he easily retired Flores and Jay Bruce it appeared he’d do just that. The Mets did not quit though, as after Knebel walked both Conforto and Devin Mesoraco, the newest Met, Jose Bautista, ripped a base hit through the left side of the infield to stun the crowd and get New York back tied. A Luis Guillorme pinch-hit walk then loaded the bases for Rosario and ended Knebel’s night, but Jeremy Jeffress was able to come in and strand all three, getting Rosario to bounce into a 6-4 fielder’s choice. Mickey Callaway replaced Lugo with his other dominant bullpen pitcher, Robert Gsellman in the ninth, and the converted starter impressively worked around a lead-off double by Shaw to assure the fans of bonus baseball. After the Mets went quietly in the 10th, it appeared Gsellman would be able to get the game to the 11th. The righty retired two of the first three batters he faced in the 10th, but with Yelich coming up, Callaway went to southpaw Jerry Blevins with two outs and a runner on first. The veteran was unable to get his man though, as Yelich roped a solid hit into right field to give the Brew Crew runners on the corners. Callaway then went to A. J. Ramos in search of one out to keep the game going, but the veteran was just unable to do it. Ramos fired nine pitches Friday. Eight of them out of the strike zone as he walked both pinch-hitter Hernan Perez and Shaw to disappointingly end the game with a walk-off walk. New York will try to wipe this game and start fresh today, as Jason Vargas will attempt to back up his first good start as a Met with another strong outing opposite righty Chase Anderson.